Born on June 5, 1954. In 1976, graduated from the Philosophical Department of Leningrad State University. In 1980, completed her doctoral course at the same place. On November 21, 1994 defended the Ph.D. dissertation entitled The History of the Russian Buddhology as a Branch of Religious Studies (from the Second Half of the 19th century to the first third of the 20th Century). From 1990 up to present, a senior researcher at the Leningrad/St. Petersburg Branch of the Institute of Oriental Studies (now the Institute of Oriental Manuscripts) of the Russian Academy of Science. 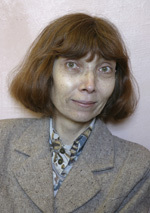 During several years, she was the academic secretary of the IOM. Major academic interests include the history of Russian Buddhist Studies, Buddhist philosophy, religious anthropology.